The public junior college system of Alabama was established in 1963 through the efforts of Governor George C. Wallace and the Alabama Legislature. Enterprise was selected as the site for one of the original twelve state junior colleges. Area citizens and civic groups raised money for the purchase of a 100-acre campus site, donated library materials, and provided a number of scholarships – thus beginning a history of college and community cooperation for which Enterprise State Community College is noted. On September 25, 1965, the first freshman class, number 256 students, was registered at the College which was originally named Enterprise State Junior College. These students rented rooms in downtown Enterprise and in the education building of the First Methodist Church. Fortunately these makeshift arrangements lasted only during the first year, for in the fall of 1966 the present campus was occupied. This campus has grown and now consists of seven modern buildings situated on a beautifully landscaped site. An addition to the Learning Resources Center in Snuggs Hall, an addition to Lolley Hall, and a new building – Talmadge Hall – were occupied Spring Quarter of 1990. In 1983, the College began offering credit courses and non-credit short courses at the Fort Rucker site. In February 2003, the Alabama State Board of Education approved the reorganization of ESJC with the Alabama Aviation Center at Ozark and the Alabama Aviation Center at Mobile of George C. Wallace College, Dothan. 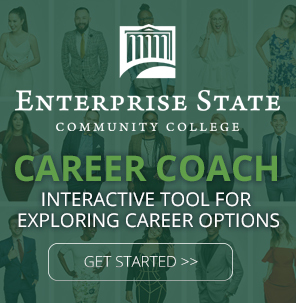 This created a new comprehensive community college which was named Enterprise State Community College (ESCC). The AAC in Andalusia opened fall semester of 2006, and the AAC at Albertville opened spring semester 2009. In December 2009, the Alabama State Board of Education approved a name change to ESCC, and approved a marketing name for the aviation programs as the Alabama Aviation Center, a unit of ESCC. The mission of Enterprise State Community College, including the Alabama Aviation Center, is to serve students and communities by providing educational opportunities that enhance the quality of life and promote economic development. Enterprise State Community College is accredited by the Southern Association of Colleges and Schools Commission on Colleges to award Associate’s degrees and certificates. Contact the Commission on Colleges at 1866 Southern Lane, Decatur, Georgia 30033-4097 or call 404-679-4500 for questions about the accreditation of Enterprise State Community College. Specific questions regarding ESCC’s educational programs, admission requirements, financial aid, and other matters related specifically to the College should be forwarded directly to the College.